SwordSearcher provides several options for changing how and when text displays are synchronized. The default settings will serve most users well, but for some, being able to tailor the synchronization actions will streamline study work in SwordSearcher. This article explains these options. Customizing synchronization settings is considered an advanced topic and you should already be familiar with SwordSearcher's main layout (Bible, Book, Commentary, Search Results/Verse Guide panels). For a quick refresher, you might want to skim the SwordSearcher Design Overview article. 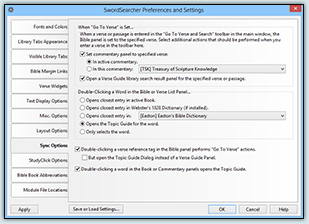 Double-clicking a word in the Bible or Verse List panel opens the Topic Guide for that word. Double-clicking a word in the Book or Commentary panel opens the Topic Guide for that word. 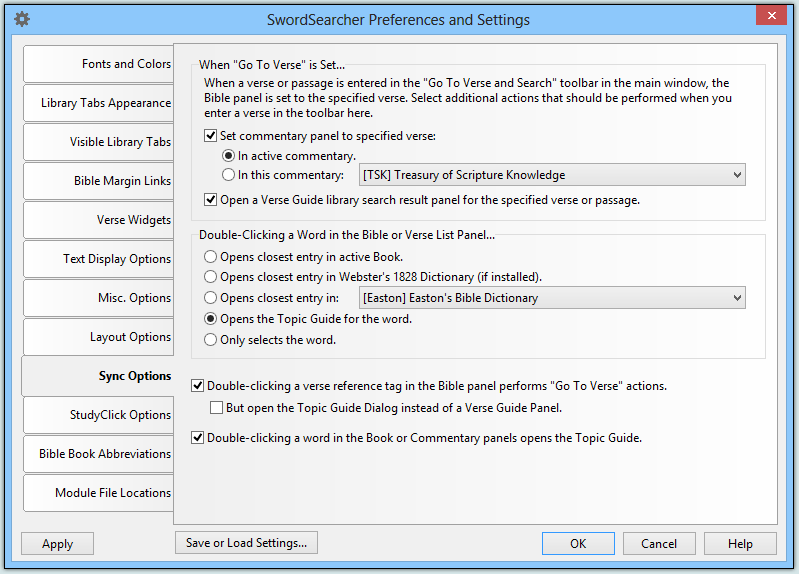 Typing a verse in the Go To Verse box (at the top of the SwordSearcher window) sets the Bible panel to the specified verse, opens a Verse Guide panel for the verse, and sets the currently active commentary to the verse. Synchronization options are set in the Preferences Dialog. On the SwordSearcher menu, select File > Preferences, and then select the Sync Options tab (example shown at right). You can select a specific commentary to sync when the Go To Verse box is used, rather than having SwordSearcher just use the currently active commentary. You can disable the opening of a Verse Guide panel every time the Go To Verse box is used. You can change how the Book panel responds to a word double-click in the Bible panel. For example, you can choose to have the word looked up in the Webster's 1828 Dictionary, regardless of what book is already opened. You can select a specific Book to be used for the lookup, or disable this synchronization action altogether if you do not like it. Finally, you can have the Topic Guide open instead of the Book panel being used. There are additional options for disabling certain synchronization actions which are self explanatory. SwordSearcher offers a lot of flexibility with these synchronization options, and if you have them set to your liking you can speed up your Bible study work-flow. However, it is important to mention that usually, users will get to what they need with the Bible margin links rather than relying on synchronization actions.